Fraylash in the fifth installment of the VayneLine Chronicles, it follows the story of a Hunter named Frayno who takes the job of trying to kill a famous Hunter-Slayer named Lashia. Brish is a major business man of the city who has personally increased the bounty on Lashia to try to entice people to take her down. Frayno is a skilled Hunter, which are people who tracked down criminals and hunt them for their Rank. Rank is a criminal rating system, and is a type of bounty system, meaning Hunters survive entirely by hunting criminals. Lashia is unique in that she has achieved the ‘Hunter-Slayer’ title of killing Hunters. This does not carry any extra weight beyond the penalty of murder, but among Hunters it is a major point. Some stay away as it is clear they are skilled, whereas others are intrigued by the challenge. Frayno knew two people that Lashia killed and starts with a bit of a curiosity and drive to see if she is as good as it seems. What happens is that she is far more skilled than he expects and spares him in their fights. She taunts him repeatedly, telling him they are destined to be together. Frayno finds out she lead a prison break of androids on a planet that hates them. She lives in the slums of a city that is bifurcated with a extremely nice and clean inner city. The entire planet suffers from frequent solar storms that render many electronics and communication problematic. As the story continues, Frayno is naturally violent and has no problem killing and attacking her followers because he is very misanthropic. This leads to him not liking Brish either and stuck between the two. After many close calls between the two of them, he starts to realize why everyone in the inner city wants her taken down. Frayno is caught between his pride of not wanting to lose a hunt, the danger that Lashia is far more skilled than him, and the mystery of why she keeps toying with him. Frayno got his rifle from a criminal he was chasing, as part of a deal of letting him off he would get the rifle. Frayno accepted. 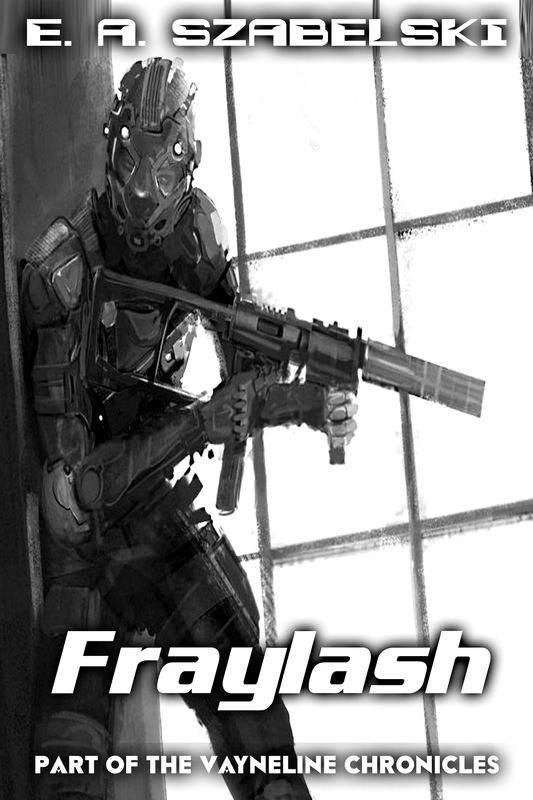 Fraylash tells the story of a Hunter named Frayno who is revealed to have to hunt down Lashia within a couple of days because she has hidden data to implicit crimes. The story starts off with Frayno going into a ghetto to chase Lashia. He takes her bounty because she has a massive bonus placed on her. The reason for this is she has killed many Hunters like Frayno before. He hits the guy stopping him to the floor, showing Frayno’s disdain for people in general. As the story evolves it becomes obvious that he exists on a gray side of the law mostly due to a heavy misanthropy. Hunting for her inside, he finds some humans he refers to as ‘trash’. Lashia contacts him through a seemingly telepathtic mechanism which makes him think his ICS is hacked. She taunts him and comes very close to shooting him, something that happens often in the story. Lashia demonstrates superior agility by flipping through the second story window. Frayno largely avoids death with some degree of combat psionics. At one point she had shoot him and it grazed his cheek, the wound does not heal as fast as others which makes him think it was poisoned. This is the avenue in which she was available to hack his ICS. She throws a gravity grenade that nearly kills him, while unconscious he thinks back to when he was a kid – and the day his dad died. He wakes up and leaves in a rain storm. The next day meets Brish, a fat man who posted Lashia’s bounty. The two do not get along and Frayno is here only for the money. Frayno explains the Rank system and wonders why Lashia’s bounty expires soon. Lashia contacts him, and refers to talking to Brish, revealing she can track Frayno. Lashia talks as if things are ‘Fated’ and dismissively of the previous people she killed. They have a battle of wits, ending with Lashia repeating Frayno’s voice. Her followers attack him, and she actually guides him to escape. He goes underground following heart symbols, ending up at his hotel – inside the secure inner city. Later at night Frayno starts to question his mission, including wondering if others questioned it too before she killed them. He thinks back to his dad dying due to petty crime which was the cause of him becoming a police. It was too by-the-book and he became a Hunter instead. In the flashback he kills his dad’s murderer to see if he can feel anything and does not, realizing his quest was largely for naught and sending him into a partly nihilistic existence. Talking to Brish, he finds out she led a prison outbreak of androids. Back in the slums he doesn’t hear from her, but attacks a guy who tells him to stop chasing her. Later Lashia talks to him more, questioning why he is doing this given he is sympathetic to andriods and essentially enforcing things he doesn’t believe in. He has only a little time left to figure out why her bounty expires. Given that many electronic devices don’t work with the impending storm, when he starts to make a recording about his future death and the playback doesn’t work he realizes the secret of Lashia and her voice copying she played for him. He decides to meet her on the roof, without a weapon. She comes and threatens to kill him, but he plows forward with what he figured out. She is an android. Further, they have shielded system and their memories can be used as evidence, given Brish was running an illegal operation here she needed off the planet to get help. Her voice copies were her clue to him. She breaks down, crying and glad he figured it out. They go back to Brish to kill him. In a surprise attack he shoots Frayno, but Lashia takes the hit before killing him. She reveals she is a combat android and can shrug off the impact. They decide to partner up (she is still relatively ‘young’) and he will show her the ropes after helping clear her Rank. She says it was ‘Fated’ to which he replies using her oft-used phrase of ‘Of course’.